A lost Renaissance masterpiece has been rediscovered after being left in storage for nearly 60 years. The owner of the painting had asked an auctioneer to visit his terraced home in Cheltenham during the summer to examine glass and china. But a photograph of the painting set the expert's "antennas buzzing", and led to its identification as the work of Ludovico Mazzolino, painted in 1522. 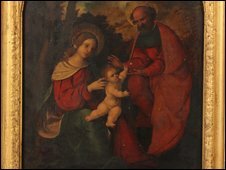 Madonna and Child with St Joseph is expected to sell for up to £60,000. It will be put up for auction on 1 October. Auctioneer Guy Schwinge, from Duke's of Dorchester, said: "I came to the house and it was all nice stuff - but not what you'd call exceptional. "But a photograph of the painting sent my antennas buzzing. I knew there was something there." Experts from the National Gallery in London identified the painting, and could even trace its history. They found it was last sold at auction in London in 1812, when it sold for £20. It was handed down to the current owner after his great grandmother bought it in Italy in 1862. Mr Schwinge added: "What makes this painting so exceptional is its provenance. "With the help of the National Gallery we have been able to identify that it was last sold at public auction three years before Napoleon was defeated at Waterloo." The seller, a pensioner who does not want to be named, said he put the painting into storage in 1950. Mazzolino was born in Ferrara, Italy, in 1480 and died during a plague that devastated the area in the late 1520s. His work led to him being considered a master among Renaissance painters. The 18.5in (47cm) x 13.5in (34cm) picture has a guide valuation of between £40,000 to £60,000. A Mazzolino painting sold for almost £350,000 in July 2005.